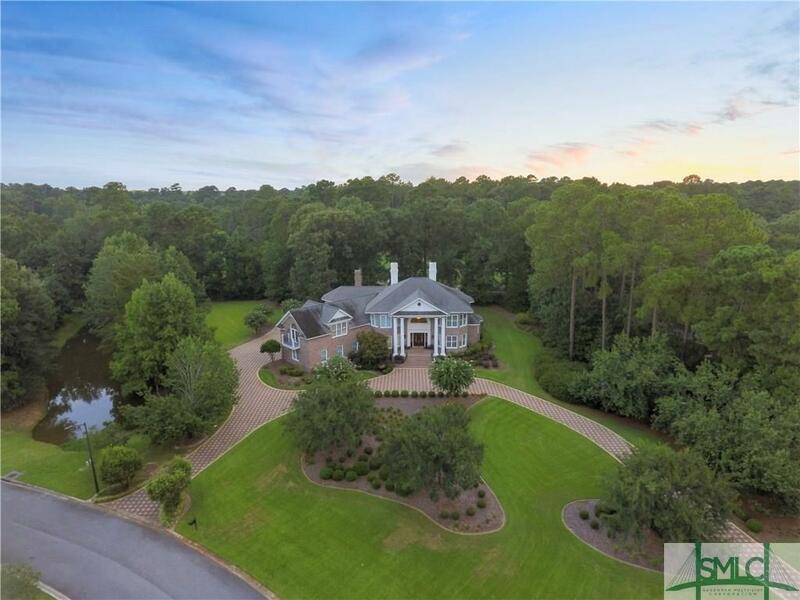 1 Myrtlewood Drive - Gracious custom designed, quality crafted 6290 Sq Ft, 4 bedroom, 5.5 bath brick home positioned on a double Southbridge lot with both lagoon and golf views. 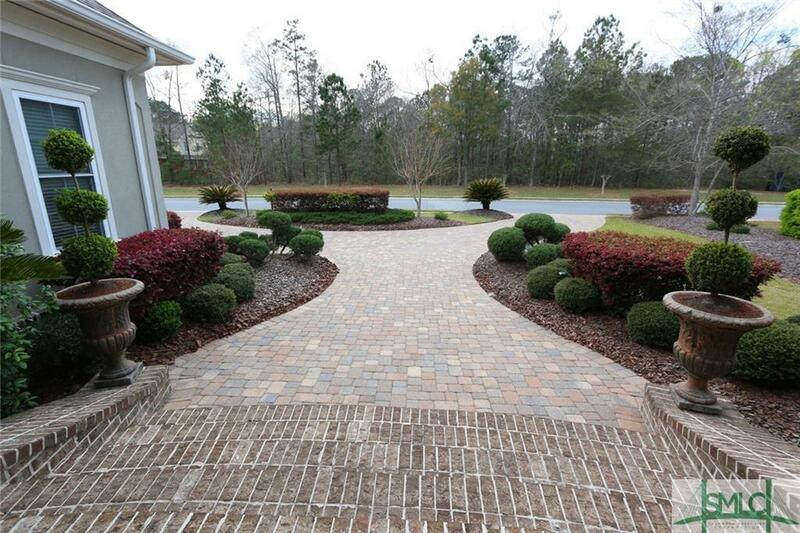 Immaculately maintained and elegant throughout from the uniquely patterned paver driveway to marble entry with sweeping circular stairway. A kitchen fit for a discerning Gourmet includes Sub-Zero fridge, coordinating granite surfaces, island seating and adjacent casual dining and family living areas, an entertainers dream. Master on Main plus gorgeous Paneled Library. 3 additional en suite bedrooms up with adjoining living area, second floor balcony, and huge bonus room. 3 car garage. All floors accessible by elevator. The exterior boasts privacy, multiple porches, room for a pool, lavish landscaping, 2 Shallow Wells for irrigation and Catepillar commercial 60kw whole house smart generator. Membership fees required for some recreational facilities. GREAT, stable investment property! Rare opportunity to own an entire brick quad building with 4 condos in the only gated section of Southbridge - Savannah's most popular golf-swim-tennis-fitness & spa community! Yes the entire building is for sale...perfect 1031 exchange prop OR live for FREE in one condo and rent the other 3! Upper units are 3092 sf, 3BRS, 3.5 baths plus bonus room, outdoor screened porch & built-in elevator shaft for future installation; Lower units are 2440 sf, 3 br, 2 bath, screened porches. Each condo has an attached 2 car garage and a view of the Golf Course and Lagoon. All are equipped fully with kitchen appliances inc. refrige & washers/dryers. The building is wholly owned and therefore not subject to HOA rental regulations. The units have stayed rented 100% of the time since the Seller has owned the building. 2 additional condo building are for sale identical to this one in Richmond Hill, GA gated River Oaks community. See MLS # 188613 and 188587. 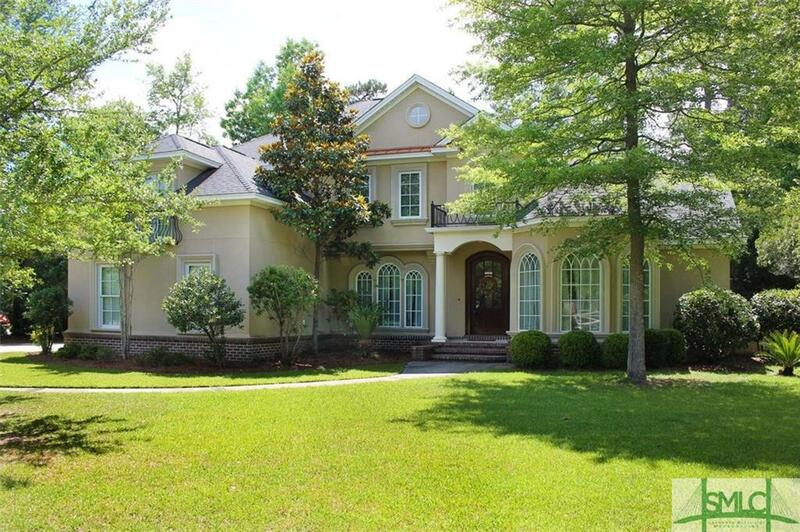 Luxurious ultra custom, impeccably maintained home, featuring solid hickory floors throughout. Some of the details include 12 foot ceilings, custom wainscoting, rope lighted three piece crown molding, game room/home theater with true pro level components for the ultimate viewing experience, executive study, a complete custom bar with full size sink, refrigeration, ice machine, outdoor kitchen and massive covered porch, and heated and cooled garage that accommodates 5 cars and golf cart comfortably. All of this overlooking 16 acre lake in amenity filled Southbridge Golf Community. For exclusive view of all interior pics and appointments, please contact your Realtor. 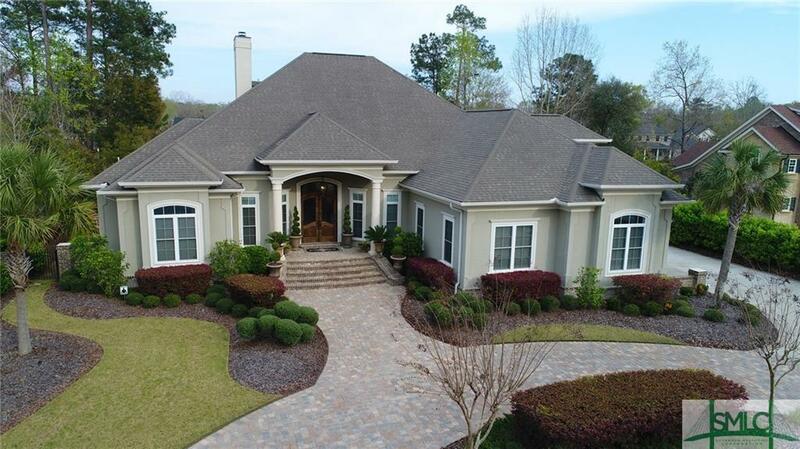 Exquisite custom built home with 3 car garage. 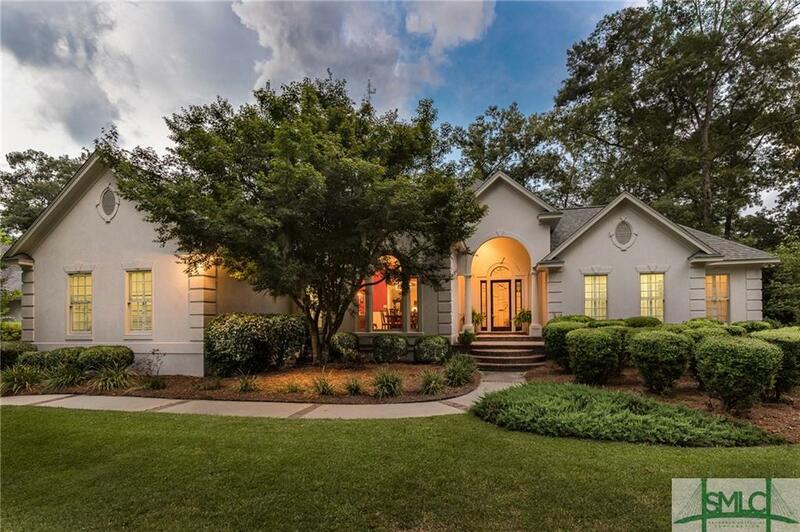 Located on 1/2 an acre of privacy in one of Savannah's finest neighborhoods.Treat yourself to a home you will be proud to own. 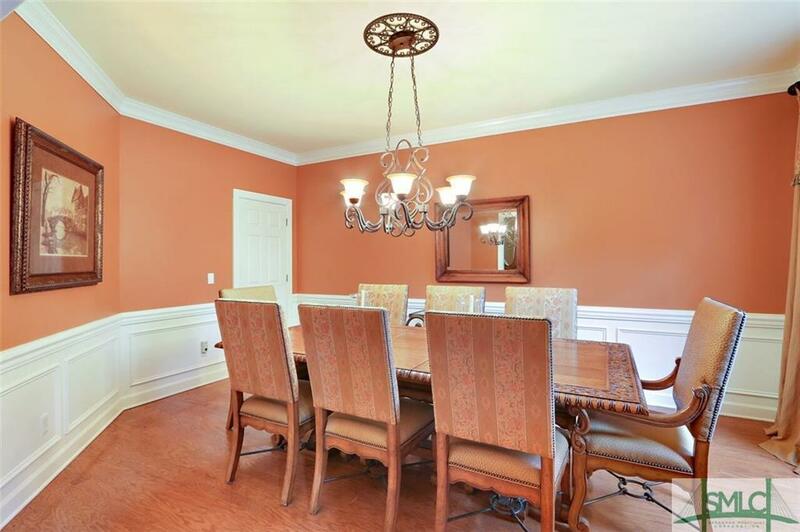 Beautiful hickory hardwood floors, exquisite moldings & detailed finishes. 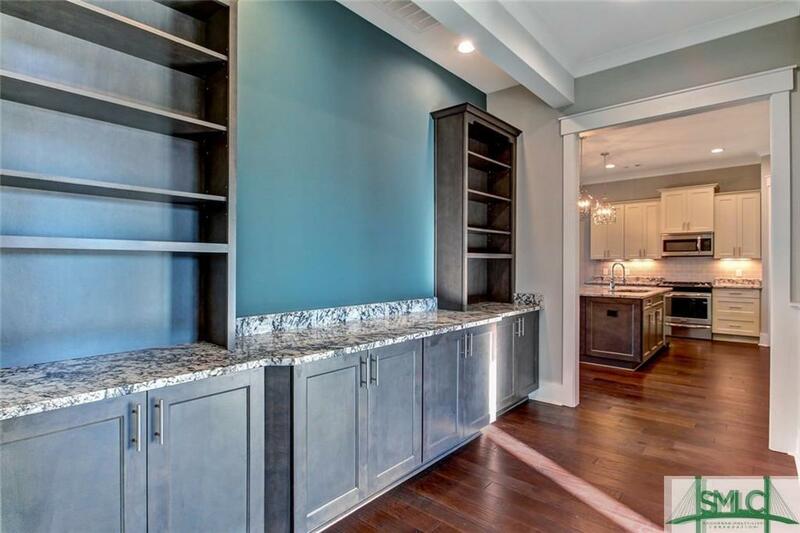 Gourmet kitchen w/ custom cabinets, Jenn-Air appliances & large island which is open to a fireside family room with built-in shelves and 12GÇÖ coffered ceilings. Your eye is drawn to the large open windows & french doors leading you to an outdoor terrace retreat. Master Bed is situated away from the main living area on main floor w/ trey ceilings & luxurious ensuite to include double vanities, garden tub & walk in shower. There is also a guest bedroom/full bath down perfect for when company visits. The 2nd level of the home has 2 generously sized bedrooms with 2 full bathrooms. 2nd and 3rd level is an entertainerGÇÖs delight with 2 Bonus/media rooms. **3 HVAC units, custom closets,tons of storage, built in surround sound & fenced in backyard. 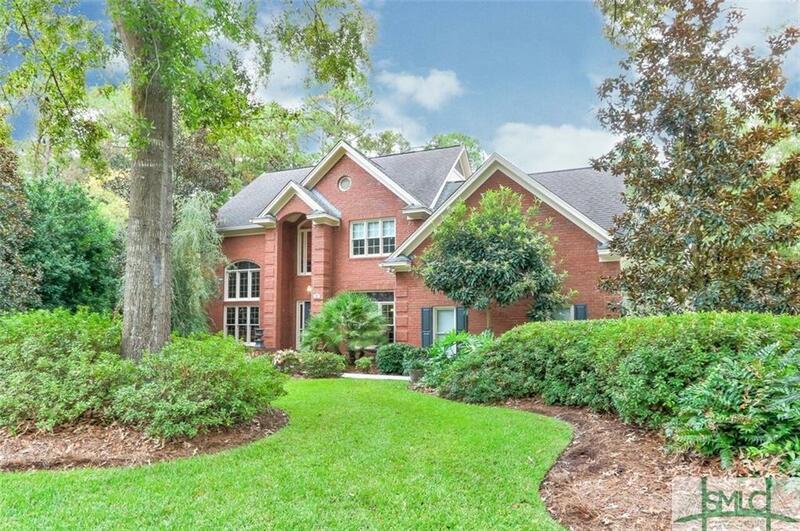 Stunning home situated in one of Savannah's most desired neighborhoods of Southbridge. Immaculately maintained 4 bedroom/2.5 bath home with all pine wood floors down stairs and master suite on main floor. 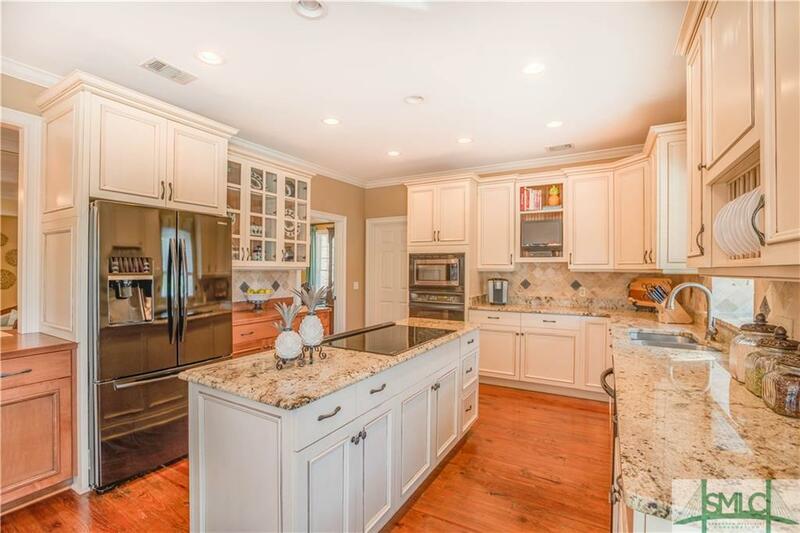 Thoughtfully renovated kitchen offers granite counters, custom cabinets, large island & breakfast area. The kitchen opens up to the family room and enclosed sunroom which offers lots of natural light and views of the private lot/golf-course. Master suite consist of a newly renovated master bathroom that boast double vanities with brand new quartz countertops, oversized marble shower and garden tub. Upper level hosts 3 oversized bedrooms, 1 Bathroom and a large loft area.The bottom level of the home is a full 34x52- 2 car garage with mudroom/storage area and a 5th bedroom/in law suite w bath. 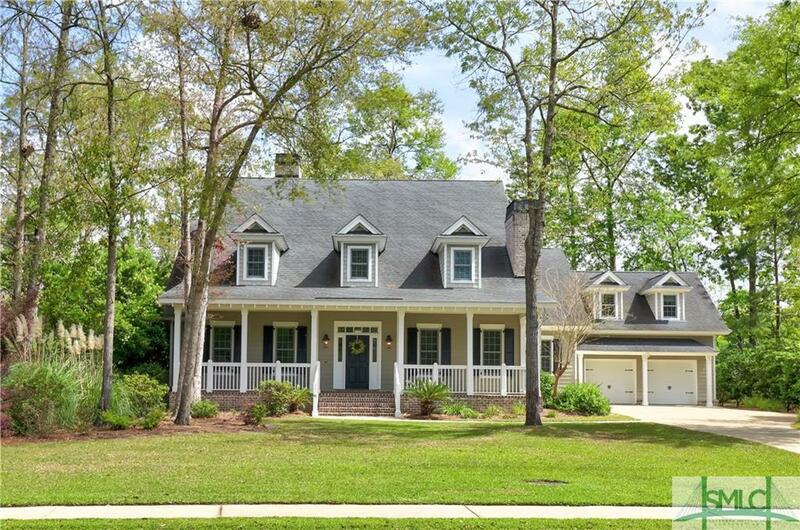 Gorgeous manicured grounds with covered porch and outdoor grilling patio. Spectacular executive style home in Southbridge offering some of the finest construction and finishes in the area that will not disappoint. 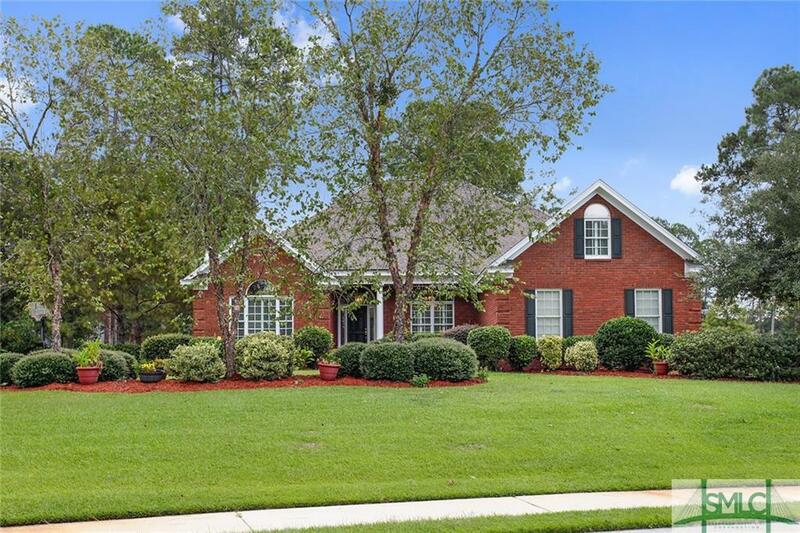 This spacious brick home is located on a very private almost 1 acre fenced lot with lush, mature landscaping. The massive moldings throughout along with the new wide plank wood flooring in most of the downstairs are only some of the exquisite finishes. Fabulous gourmet kitchen with stainless appliances opens to a very large living room/family room. Upstairs there is an enormous bonus room with a full bath, and separate media room. There is a private screened breezeway/lanai from the garage to the family room, and a separate lanai off of the master bedroom and family room. 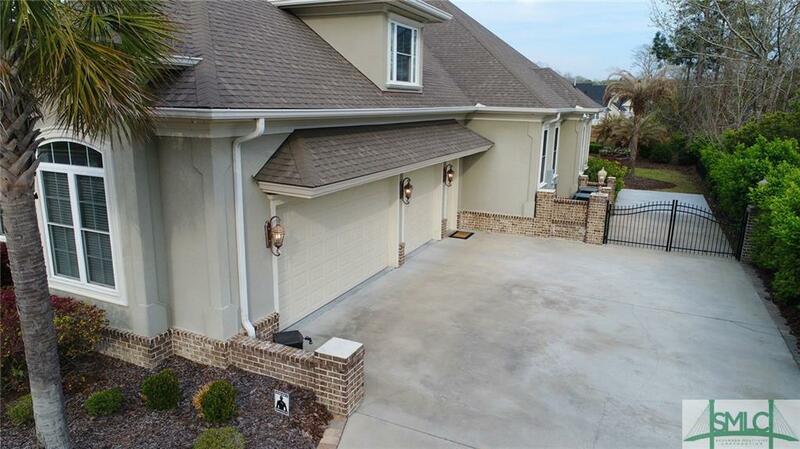 The rear facing three car garage with finished concrete floor cannot be seen from the street. Tremendous amount of walk-in attic storage. Southbridge GÇ£HistoricGÇ¥ area, private location in Cedar Point Estates. Custom built 2 story home, extended views of the 18th fairway, green, lagoon & clubhouse. Custom details include the 2 story foyer, curved staircase & fixed windows. Elegant formal LR & DR open into the spacious kitchen, island seating, adjacent dining, keeping rm & office area w/built-in desk & bookshelves. 2 covered porches overlooking lush back yard, natural light, N&E direction, no hot sun! Great for entertaining all ages. Master-suite down w/2 walk-in closets, built-in cabinets & drawers. The staircase leads up into the billiard/family rm w/covered balcony, gorgeous views. 2 bedrooms w/separate baths. Major renovations in 2013 include kitchen & master bath countertops, appliances, paint inside & out, hardwood floors refinished, bathroom fixtures, new hardware, gutters, new roof, heating & air units. Major landscaping: plants, sod & irrigation. 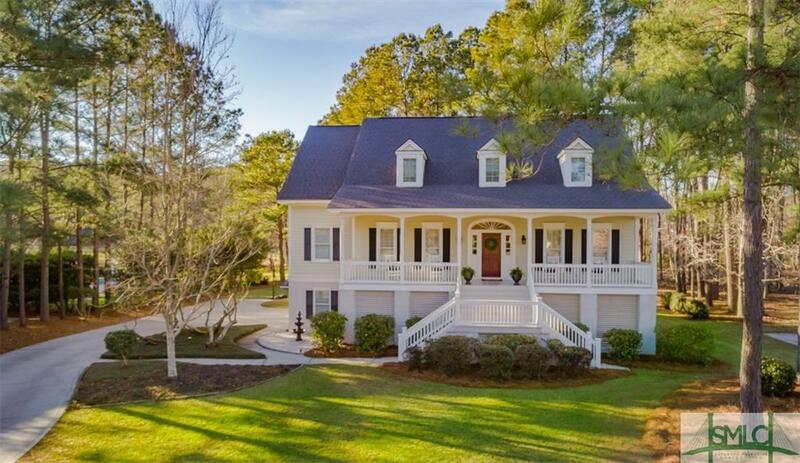 Sellers are licensed Realtors in the state of Georgia. 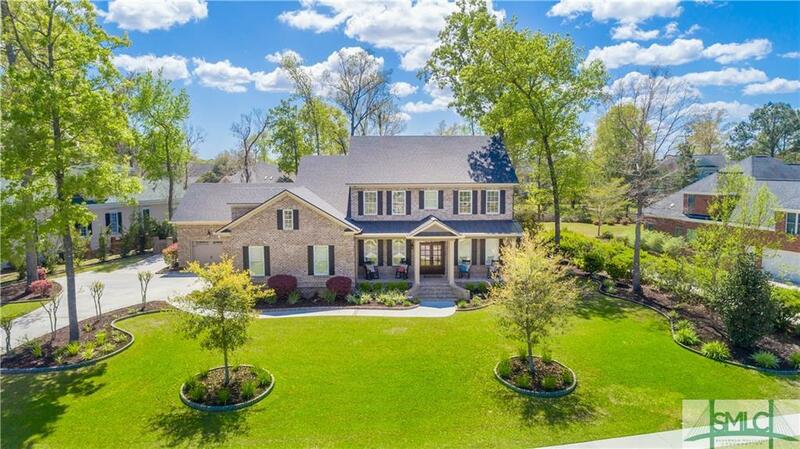 Beautifully detailed custom home with wonderful indoor/outdoor living spaces including a sweeping front porch and a brick floored screened GÇÿlivingGÇÖ area with built-in grilling area overlooking wooded yard & lake. The wide entry has gleaming Brazilian cherry flooring leading to an expansive Great room with beamed ceiling & fireplace. A gourmet kitchen has Corian counters and an adjoining Dining Area, all with serene water views. A large den/library with fireplace can be used as dining if preferred. The first floor has a large Master Bedroom overlooking the water with a bright, elegant spa bathroom with dual marble top vanities, a soaking tub and separate shower. A guest suite with full bath also on main. Two additional bedrooms on the second level with third bath, and two bonus rooms. One bonus set up as a theater, and one as a media room, both with built-in speakers. The home lives large & lives well. Seller will provide 3,000 in closing costs and a Home Warranty with accepted offer. BEAUTIFUL! One of Southbridge's most elegant homes! Unique architectural design & great natural light make this a one-of-a-kind home. Located in the popular "Historic" area of Southbridge with well-established, lush landscaping, this concrete stucco home overlooks the fairway & lagoon. 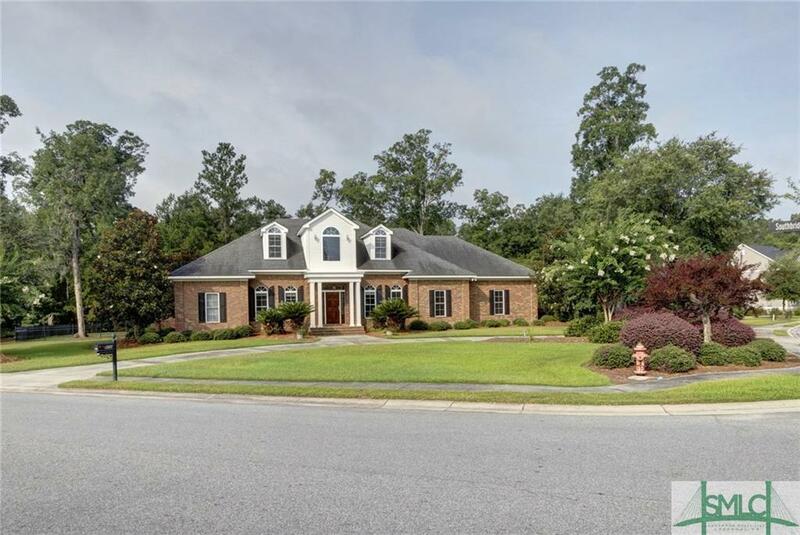 The floorplan features a stunning, curving staircase, 10ft ceilings thru 1st floor, formal living room/study, family room, Master BR on main w/his & her closets PLUS another bedroom w/private bath on the main floor. The kitchen is beautiful w/cream cabinetry & large island, gas/convection cooking, butlers pantry & true breakfast room w/window seat. The upper level has two more spacious bedrooms w/jack 'n' jill bath & access to an outdoor balcony to enjoy gorgeous sunsets! Closets galore, real hardwoods thru 1st floor, plantation shutters & encapsulated crawl space (10k)! Tell your Realtor you want to view this home! Absolutely stunning two-story traditional home with beautiful trim detail and a FABULOUS view of Grand Lake at Southbridge! 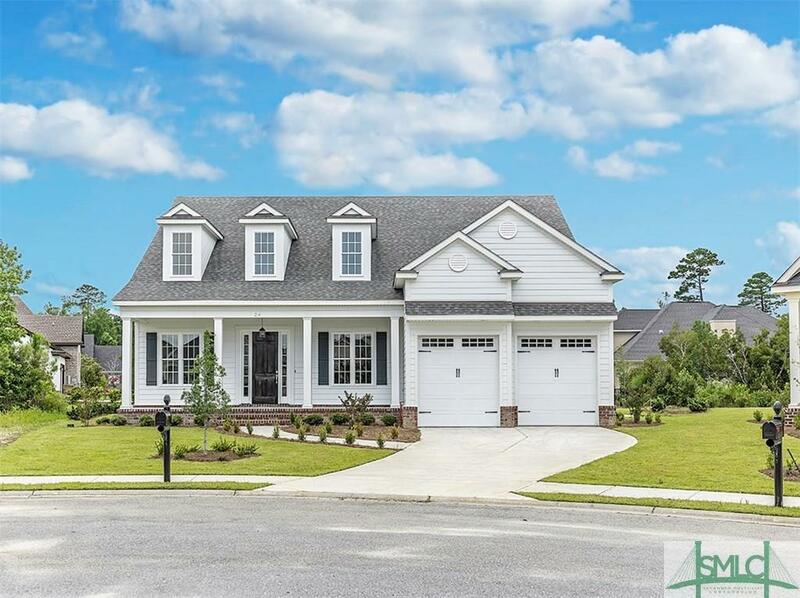 Custom built by Hallmark Homes of Savannah, 37 Grand Lake Circle is Indeed GRAND! It offers a large entrance foyer, office, Formal Dining Room & Living Room with soaring two-story ceiling & an awesome gourmet kitchen open to oversized breakfast room & family room with built-ins, fireplace and exposed wood beam detailed ceiling! The kitchen features contrasting custom cabinetry, granite countertops, stainless appliances & a large pantry. The master suite is on the first floor and affords beautiful views of the lake! There are 3 generous guest bedrooms upstairs AND a large bonus room over the 3 car garage! 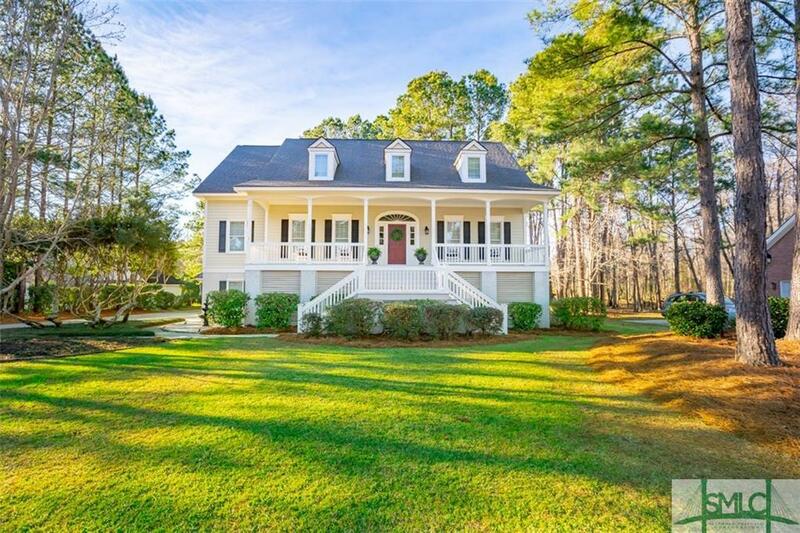 Enjoy Springtime in the South from the beautiful covered rear porch complete with fireplace! This home has so much detail from the rich mahogany floors, ornate crown molding & trim detail and lots of windows to let the sun shine in! PRICED TO MOVE YOU! 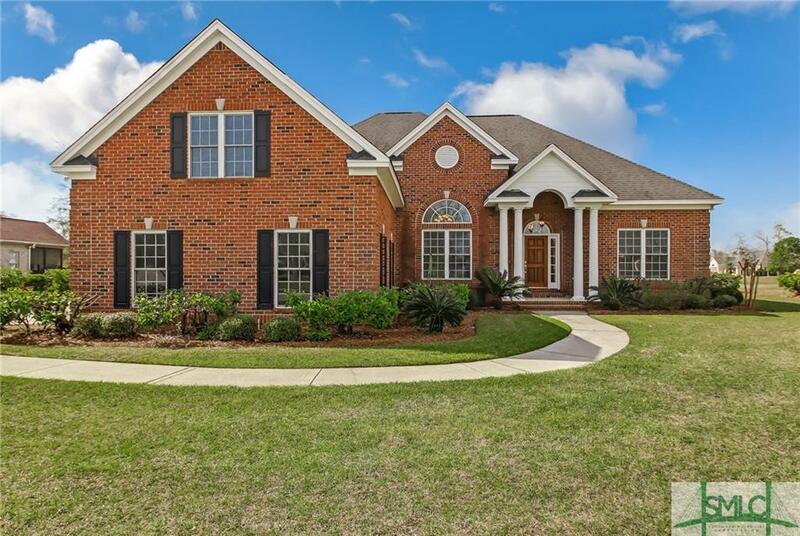 Enjoy gatherings in this beautiful brick Southbridge home. A bright open floor plan with formal dining room, living room with fireplace, vaulted ceiling and glass doors that lead to tranquil lagoon views. The main living area boasts new 7" wood plank flooring throughout, a spacious kitchen with stainless steel appliances and built-in casual dining. Large owner's ensuite, two bedrooms and one and half baths. The staircase leads you to a generous landing which overlooks the living room perfect for reading or working. Once upstairs there are two sizable bedrooms and bath. A large bonus room area for a magnificent Brunswick standard sized leather pocketed pool table (included with the sale) and a bar area. This home includes a top of the line water softening system, plenty of storage space throughout and an oversized two car garage. 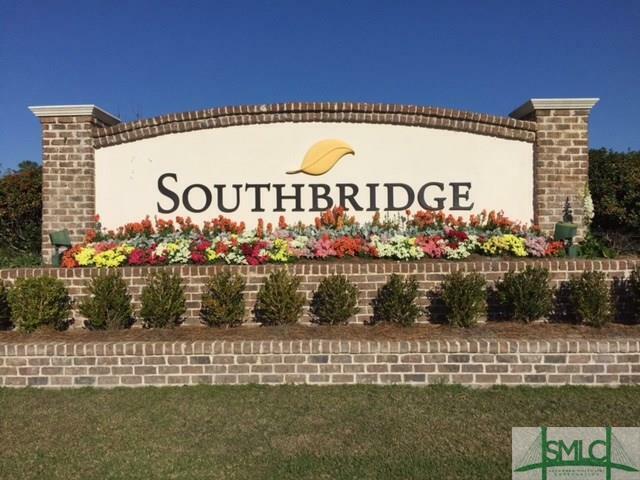 In desirable Southbridge Community where you can enjoy amenities such as tennis, golf, walking trails, playground, swimming and Grand Lake Lodge. Come Home to Southbridge and enjoy all that club life has to offer! 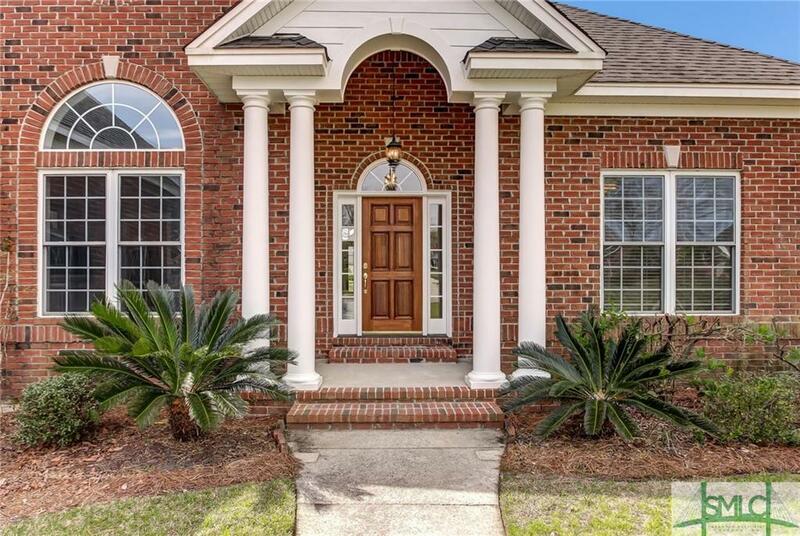 104 Greenview has been immaculately maintained and includes a very desirable open floor plan with beautiful volume ceilings that let the sun shine in! 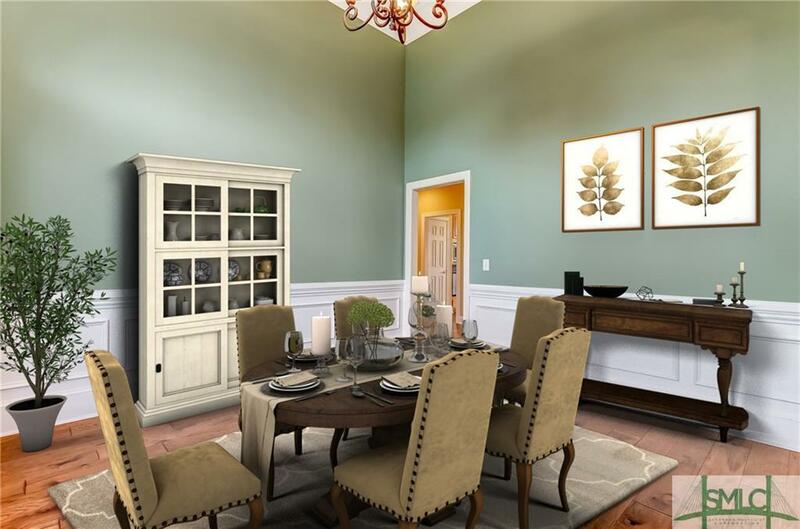 The main area includes a foyer, huge office/living room to the left of the front entrance and grand formal dining room open to great room with fireplace and built-ins - with a bank of french style windows/doors along the rear! The kitchen offers granite countertops and stainless appliances, plus plenty of bar seating, breakfast area and pantry! The bedroom arrangement is a split with generous master suite on one side, two guest bedrooms on the other, and large guest bedroom and bonus room/5th bedroom upstairs! There are hardwood floors throughout the main living areas and fresh paint and new carpet in most other areas! The landscaping is lush and well-loved and the lagoon and golf views are some of the finest in the neighborhood! This home is a "Must-See!" Master on the Main! Gourmet kitchen with Sub-Zero fridge, granite counter tops and Bosch dishwasher. Formal living and dining room. Family room features Travertine flooring and gas fireplace. Screened in porch for outdoor entertaining or to just enjoy the lovely evenings. This beautiful home has it all! 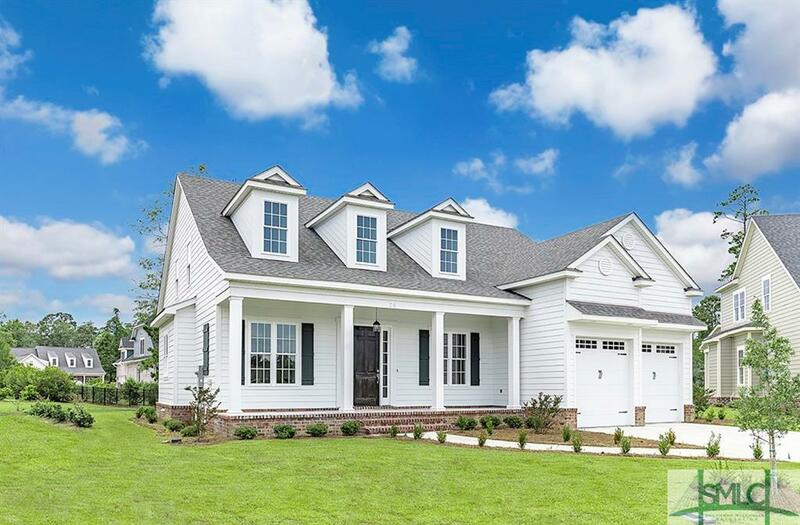 The "BlueBell" by Beacon New Homes is a stunning 4 bed, 3.5 bath with bonus home located in Savannah's highly sought after Southbridge community! This luxurious home offers attention to every detail including gorgeous hardwood flooring, artful moldings, and custom light fixtures throughout. Entertaining is made simple by the home's elegant formal dining room and spacious open concept floor plan where an inviting living area meets the beautiful gourmet kitchen complete with gorgeous granite counter tops, stainless steel appliances, and an over-sized center island. The main level owner's suite offers a peaceful retreat including a large walk-in closet and luxury bath boasting desired double vanities, jetted tub, and separate shower. Enjoy an abundance of neighborhood amenities including a resort-style community pool and clubhouse, fitness facilities, tennis courts, golf course, and more! Conveniently located near restaurants, shopping, HAAF, and Gulfstream with easy interstate access.